The TCosy™ solution is flexible, versatile and accommodates any size or shape, allowing complete freedom with regards to choice of vernacular and style. TCosy™ not only transforms the exterior of a house, but also provides you with all the long terms environmental and health benefits of Passivhaus living. 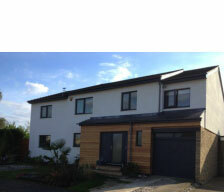 Brief: To extend and retrofit a 1970s three-bedroomed house to Passivhaus standard while aesthetically updating it to create a light, modern and energy-efficient family home. Project scope: Design and build of a two-storey extension to the west side of the house and a first floor extension above the garage to the east. The extensions were built to Passivhaus standard, and the existing building retrofitted with the Beattie Passive TCosy™ system, including the loft space and underneath the house to form a highly insulated airtight 'box'. High performance windows were fitted throughout and a mechanical ventilation heat recovery system installed to maximise energy efficiency, ensuring no additional heating system was required. "Having no central heating system was a real leap of faith but after two winters in our lovely, light retrofitted house, it's a revelation that we're warmer and more comfortable than in any other house we've lived in".